Oh Muni... the system that keeps going in the red while the union whinos keeps bickering about striking. Well folks, the price of Muni is going up. For most of us, it will be an additional $24 a year to ride of the most depressing systems on earth. Or for you suckers using commuter benefits with direct loading of passes to your Clipper card, it's $48 a year ($24 in Muni hikes, and $24 in commuter benefit service fees). Adult passes will be raised by $2. "A" fast pass will go up to $72 a month, and "M" Muni only pass will go up to $62 a month. Youth, senior, disabled, and lifeline passes will be raised by $1. Y/S/D passes goes to $21, and lifeline goes to $31. Cable car prices goes up $1. Single ride will go up to $6 and on-board purchased day-pass goes to $14, and late night/early morning disabled & senior fare goes up to $3. All visitor passport books goes up $1. Special service fares goes up $1 and $2. Adults will pay $12 (from $10), Y/S/D pays $10 (from $9), and those with a valid Muni pass pays $8 (from $7). Basic cash fares for Muni will still stay the same. $2 for adults and 75 cents for the rest. For the complete list of changes starting July 1, 2011, click here (PDF file). 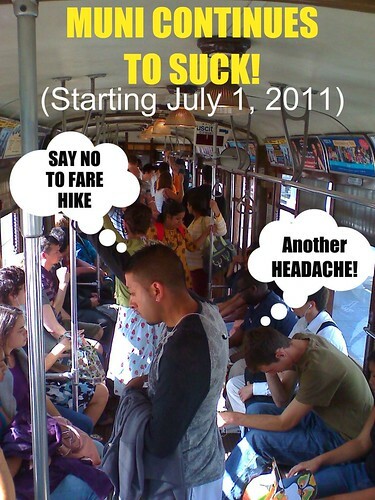 Lastly, a PSA for all youth and senior Muni passengers: Paper passes will not exist starting June 1, 2011. Get a specialized Clipper card NOW. Slacking off = FAIL. You forgot Handicapped parking or parking in hash zone next to handicapped going from 335 to 935!